The VectorSphere is a dedicated laboratory for mosquito biology and control, at IHI’s Ifakara Branch. 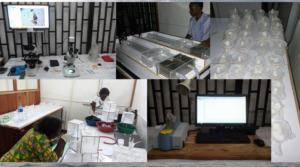 The facility comprises various lab stations and colonies of various mosquito species, for purposes of research and post-graduate training. In these colonies, we rear local strains of two species of malaria mosquitoes (Anopheles arabiensis and Anopheles gambiae), and also local strains of Aedes aegypti mosquitoes. Our colonies are pathogen-free and are maintained inside rooms with restricted access. Within the VectorSphere, we also have various facilities for research on mosquito behaviour, physiology and ecology. These include mid-infrared spectroscopy techniques for analyzing various physiological characteristics of mosquitoes such as age, species identity and infection status of the mosquitoes. 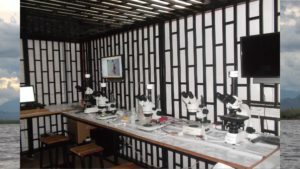 To facilitate greater understanding of the mosquito biology, the VectorSpehere now has a state of the art digital microscopy facility with multiple compound and stereo microscopes, all fitted with high-resolution cameras with LCD mounts. We also have infrared video-tracking equipment for direct observations of mosquito behaviours under reduced illumination and at night. 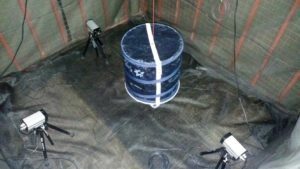 The VectorSphere has facilities for investigating presence and strength of insecticide resistance in mosquito populations against various chemicals used for control. We also have a four-layered mosquito “smell machine”, also referred to as olfactometers, useful for studying how mosquitoes respond to different odour cues. The VectorSphere also has modified section that mimic natural mosquito ecosystems, and which can be used for studies on biology and control of mosquitoes. This VectorSphere is therefore also extremely useful for practical training of medical entomologists and health officers.